Throughout the day, I have an assortment of tasks to perform. Almost all are pet-oriented. 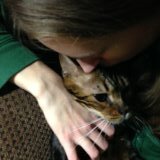 My cat was diagnosed with a heart condition at a young age and if I can get the pills down, it is beneficial for him. That’s always an if, because he is prone to fighting me on them and when I’m frantically trying to tackle my own crazy agenda, I don’t have all the time in the world to fight back. Today, I decided to coax him and resume the more rigid pilling schedule we once upheld. I have always tamed my animals with love, and as I cradle him I shower his face with kisses and hold him firmer as the pill sticks to the roof of his mouth. I know that it is unpleasant and I know the struggle with forcing your body to take the medication. It took me most of my life to learn to take pills and even today I still slip up, so I decided to keep that in mind and held him tight. Pilling a cat is not an easy task, but today it went rather smoothly, with no foaming at the mouth to speak of. One pill, two pill and he was done. I rewarded him with wet food and rewarded myself with the notion that “hey, doing these things and following through is worth every bit of allowable time.” I think that is a primary reason why I’m always late- that deep understanding of proper time use. It’s hard to know what in your life is worth the extra few minutes, but my cat’s health is assuredly one of those things. I would do anything for a best friend of mine. Speaking of best friend, my human friend of three years has become ill recently. It’s just seasonal sickness, but it’s still concerning and just as equally “no good.” I made it a point to cheer him up- “What could I get for you to help with the symptoms?” I asked. “I have no money” he replied. This is a ridiculous thing, to think he needed to pay me, I would help and I adopted a fierce determination to do so. I braved a mild blizzard to gather items any sick patient would endorse- pain killers, cough drops, soup, crackers, water, tea. It began immediately to brighten my day at the thought of the possibilities. Working two jobs, I’m more prone to having pocket change, though not the hefty kind. I can make a lot happen with a little, and it has always been my gift to give. As for the second half of this post subject, I have begun a secondary breeding project in my home, and it has been on-going for the last few months. 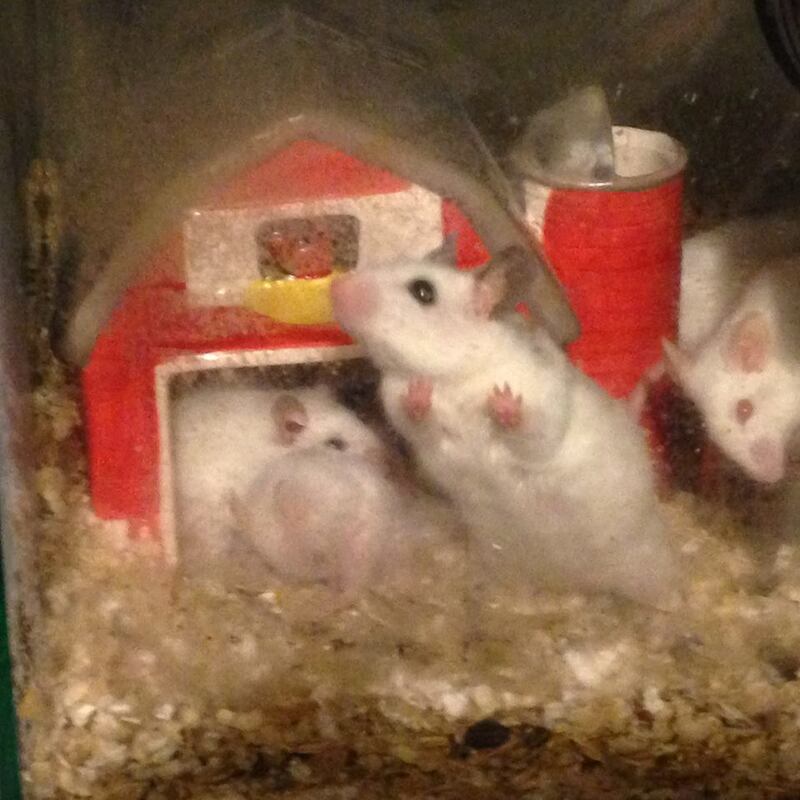 I’m raising a herd of African soft fur rats, focusing on selective breeding for high-white coloration. I’m having a lot of fun with it, and in 2015 I plan to attend reptile shows to balance out the cost of raising them and also to justify their production via the feeder mouse market. This is a different species than a rat or a mouse typically encountered in the pet trade. It tends to be a bit more vicious and bitey than it’s kin, but then with the right amount of taming down, they really aren’t so bad. And they are painfully adorable; a worse pain than any bite!! It hurts the heart to see those bulgy eyes, but I suppose not in a bad way. I’m interested to see how far this takes me, for breeding them came off a whim when I was told this rat was not easily handled- I think there is a real place for them to become an accepted pet like a hamster or gerbil or house mouse. I had a little fun after I delivered my friend’s care package and picked up some clearance ceramic barns for hides for my rat colonies. I think it compliments them well. Ah yes, the story of my life- Pilling cats and African soft fur rats! !